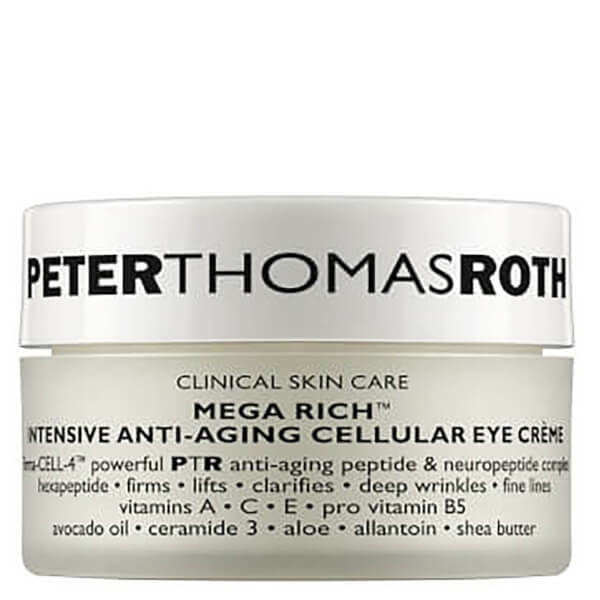 Reawaken tired, ageing eyes with the Peter Thomas Roth Mega Rich Intensive Anti-Aging Cellular Eye Cream, an age-defying formula that helps to firm and tone the look of delicate skin around the eye contour. Targeting crow's feet, fine lines and deep wrinkles, the eye cream combines a Firma-CELL-4™ anti-ageing complex with a unique bio-processing method and four peptides (SYN®-COLL, Tetrapeptide-3, Oligopeptide and Neuropeptide Argireline®) to improve the look of skin firmness and smoothness. 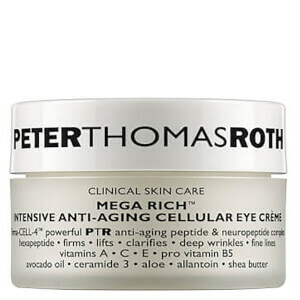 After use, skin around the eyes displays renewed clarity and tone. Eyes appear younger-looking, smooth and vibrant. Water, Glyceryl Stearate, Glycerin, Palmitoyl Tripeptide-3, Caprylic/Capric Triglyceride, Cetyl Alcohol, Carbomer, Polysorbate 20, Palmitoyl Oligopeptide, Palmitoyl Tetrapeptide-3, Retinyl Palmitte (Vitamin A), Tocopheryl Acetate (Vitamin E), Ascorbic Acid (Vitamin C), Ceramide 3, Aloe Barbadensis Leaf Juice, Panthenol, Hydrolyzed Elastin, Soluble Collagen, Butyrospermum Parkii (Shea Butter) Fruit, Allantoin, Linoleic Acid, Oleic Acid, Superoxide Dismutase, Wheat Amino Acids, Squalane, Sodium Hyaluronate, Carbomer, Quaternium-15, Disodium EDTA, Stearpyrium Chloride, Triethanolamine, Sodium PCA, Dimethicone, Propylene Glycol, Diazolidinyl Urea, Methylparaben, Propylparaben.